“The Carpenter: A Children’s Christmas Story” from Christian Faith Publishing author Terry Martin is a lovely festive tale that focuses on the gifted carpenter chosen by God to build the humble stable manger for the infant Christ. “The Carpenter: A Children’s Christmas Story”: a beautiful Christmas retelling, is the creation of published author Terry Martin, an electronic technician specializing in repairing TVs. Born and bred in Mobile, Alabama, Terry enjoys gardening and golf. He is a married father of two. 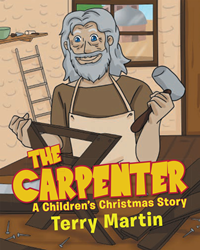 Terry writes, “The Carpenter is a children’s Christmas story about an old man who is respected in his town for his ability to work with wood. He can make intricate toys for children and very large items for adults. He is the best carpenter in the land and is sought by kings for anything made of wood. As a gift, he builds a new throne for a king from another land, who is so grateful he sends some of the best wood from his land so that the carpenter can make even finer works and gifts. “We all know the Christmas story—Mary and Joseph, the inn, the stable, the baby Jesus, and the star—but have you ever wondered where the manger came from? Published by Christian Faith Publishing, Terry Martin’s new book is a heartwarming story destined to be a holiday classic for families with little children and an appetite for the imagination. View a synopsis of “The Carpenter: A Children’s Christmas Story” on YouTube. Consumers can purchase “The Carpenter: A Children’s Christmas Story” at traditional brick & mortar bookstores, or online at Amazon.com, Apple iTunes store, or Barnes and Noble. For additional information or inquiries about “The Carpenter: A Children’s Christmas Story”, contact the Christian Faith Publishing media department at 866-554-0919.